Date:30th July 2013. 'YP Magazine.....Restaurant review at Hinchcliffe Arms, Cragg Vale, Halifax. The Cragg 15 community group are laying on a Bank Holiday Monday full of entertainment on August 31. The group hopes residents and visitors alike will turn out to support the event, which comprises an artisan market and country show, held in the part of Cragg Vale village which is around the Hinchliffe Arms and St John’s Church between 11am and 4pm. The successful combination of artisan food and crafts is making its return to Cragg Vale at the Hinchliffe Arms car park, and there will also be plenty of games and activities for children, including a bouncy castle and face-painting. And new to the event this time will be the country show element which will be set in the grounds of the neighbouring St John’s Church and will feature a number of categories you can enter. Categories include best laying hen, best trio of free range eggs, best tray of mixed vegetables, best homemade bread, best jam, best jelly, best cake, best decorated cake (children), best flower arrangement, best handicraft (adult) and best handicraft (children). All children’s categories are free to enter. Other categories will be charged at £1 per entry, and each entry will receive one raffle ticket. The raffle will be drawn on the day. You can enter either via the form on the Cragg 15 website - click on the relvant link at www.cragg15.uk - or in person on the day as long as you are there by 10am. Visitors are requested to park on the main Cragg Road and walk down to the event site, or arrive by the donation bus. service. 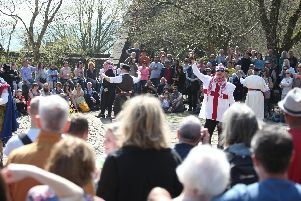 Joan Hobday, one of the organising team, said they were hoping for some good weather to top off a super day’s entertainment and hoped as many people as possible would support it, the event following on from a similar Bank Holiday success back in May. “We’d love people to get their entries in for the Grand Cragg Vale Country Show which is running alongside the now famous CRAGG 15 Artisan Market this time. “Spread the word via email, Facebook and Twitter and enjoy a great couple of hours out on Bank Holiday Monday,” she said.